Lonzo Ball is officially listed as questionable for Thursday’s game versus Indiana after suffering a left ankle sprain in Denver on Tuesday. After the loss to the Nuggets, Ball was confident in his availability for Thursday, which Walton appreciated. Ball’s injury is compounded by the Lakers’ overall lack of health, especially at point guard. Second-unit PG Rajon Rondo is out with a broken hand, while even two-way PG Alex Caruso has a sprained ankle. And shooting guard Josh Hart has been dealing with ankle issues of his own, averaging only 2.0 points over his last four games, while shooting 0-for-9 on 3-pointers. With Rondo out, the Lakers have scaled back their blazing speed. Prior to his injury, L.A. ranked third in the NBA in pace (105.5). In six games without Rondo, they are just 18th (100.3). “We don’t want to slow things down, but we also aren’t emphasizing as much as far as pushing every chance we get,” Walton said. Walton said the first reason for the Lakers’ change is that they are more focused on their defense, which has been rated 10th in the NBA over that span. But it also certainly has to do with Rondo’s absence. 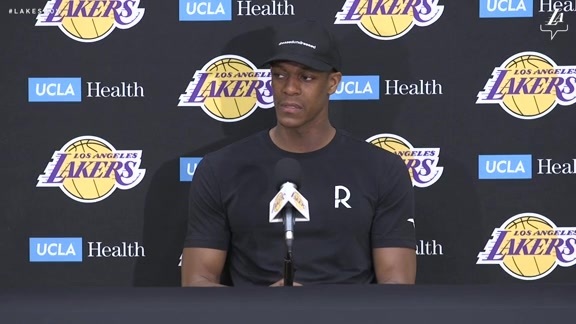 “Rondo’s a big part of leading those breaks and playmaking and getting guys in the right spots and making sure we’re taking care of the ball,” Walton said.